I have to admit that I am not Cornish, although I have lived here for 40 years. 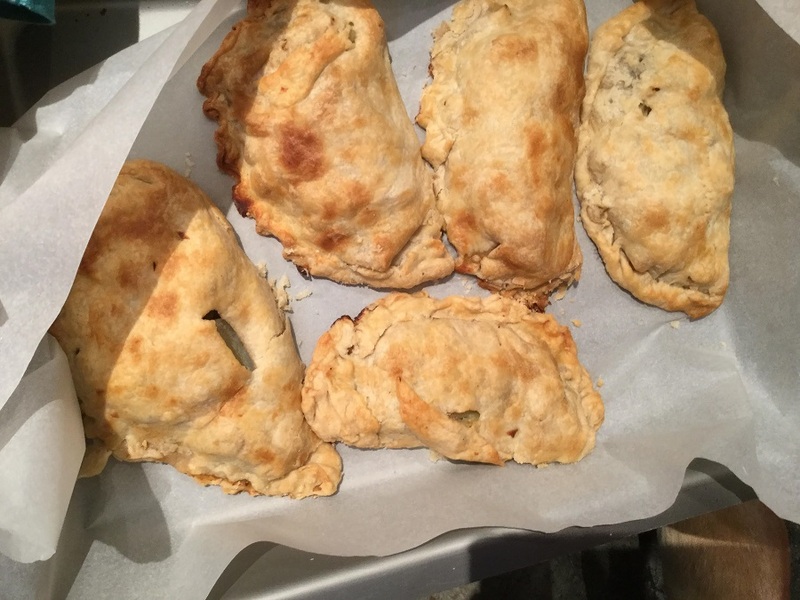 So when Sam came home after cookery club at school and wanted to make some traditional Cornish pasties I thought I would rise to the challenge. Pasty making has certain rules if you want to do it proper! Only beef, onion, potatoes (tatties) and swede go into traditional Cornish pasties, which are made using shortcrust pastry. On the way home from school we popped into Lobbs Farm Shop at Heligan to collect our raw ingredients. Phil the butcher took Sam under his wing and carefully explained that the best meat for pasties was skirt from the underbelly of a bullock. 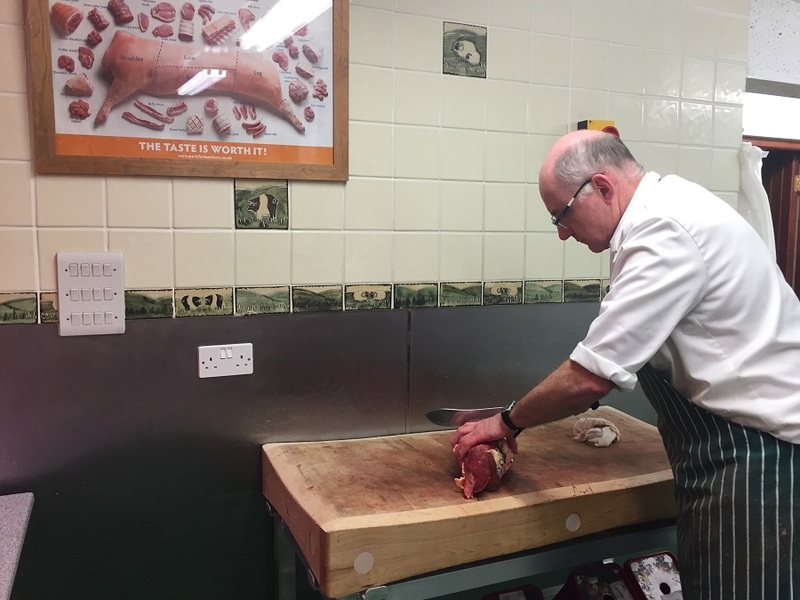 When it’s finely cut it takes the same amount of time to cook in the oven as the vegetables and contains enough fat to produce a juicy gravy (he even took the trouble to show Sam on the chart on the wall exactly where it came from). We then selected our vegetables and headed home. Before starting the next day I called Granny Gaynor for advice as she makes the best pasties I know! Her top tips were to use strong white bread flour and a tablespoon of vinegar in the pastry and to rest it in the fridge for an hour before rolling it out. This helps make sure it’s malleable but won’t split apart when it cooks. We all donned aprons and I set out little tables for Sam and Jasmine. Each of them had their own bowls to mix the pastry in. With a bit of help from me the pastry was pulled together and wrapped in cling film to go in the fridge. Next came the vegetable prepping. 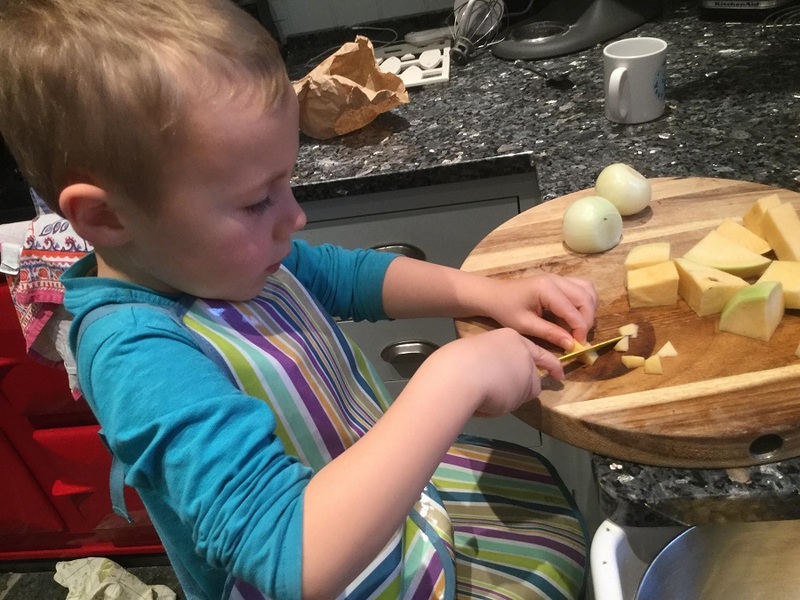 I was amazed that Sam, at five years of age, was confident enough to use the potato peeler and chop the swede with a knife all on his own. He started the onion but soon passed that job on to me when the tears began to flow! We then unwrapped the finely chopped meat, put the veg in individual bowls and got the pastry out of the fridge, cut it into eight pieces and began to make our first pasty. We floured the board and rolling pin and selected a plate about the size of the finished pasty and rolled as near a circle as we could make. Gaynor’s tip was thin sliced potato first, then meat, swede and onion, leaving enough room around the edge to fold and crimp. Sam made his pasty, then retired exhausted! Jasmine made hers and a pastry J and P to ensure they were eating their own creations! I finished the rest, popped them into the oven for 45 minutes, cleared up the mess and waited for the timer to ping. I was amazed – they stayed whole, no leaked gravy or splitting apart! The children couldn’t wait for a taste. I managed to persuade them to call Mum and Dad with a message to hold arrangements for dinner as pasties were on the way. Grandad joined us so all eight pasties were consumed with relish and pronounced delicious! It did take three hours from start to finish, and I think we could do with some lessons in crimping and presentation, but I’m sure we will do it again now we know how. 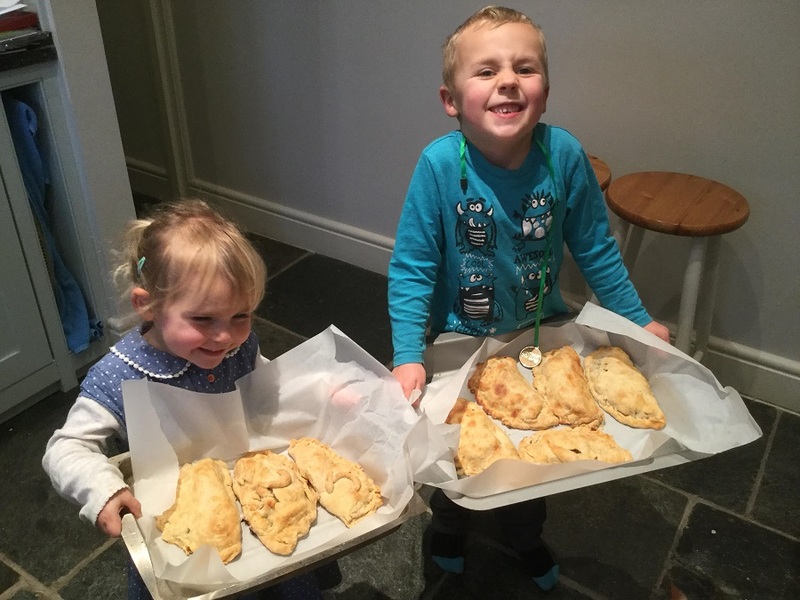 I remember baking with my grandmother, and in this day where fast food and ready meals are the norm, making time to bake and chat and teach my grandchildren some life skills is a great joy to me and hopefully will produce some lifetime memories for them. If you want to try making some at home, here’s a traditional pasty recipe from the Cornish Pasty Association. Happy baking!